Tracking your donations and paid events is key to building your donor base. Linking your Action Network account to WePay allows you to track donations. The first time you create a fundraising or ticketed event page, you’ll be asked to set up a WePay account. WePay is our payment processor — they handle the credit cards, store your money, and facilitate withdrawals to your bank account. Please create a brand new WePay account when you are asked to — do not sign in with existing accounts. Otherwise, you may not be able to receive your money. Signing up is easy and free — just enter in your name, email address, and a password to sign up. You’ll enter your bank account details later when you make your first withdrawal. Once you’ve created your account and granted us access to it, you’ll be taken back to the Action Network to finish setting up your fundraising or ticketed event page. Note: You must enter bank details within 30 days, otherwise you won’t be able to raise further money on your fundraising or ticketed event pages until you do. 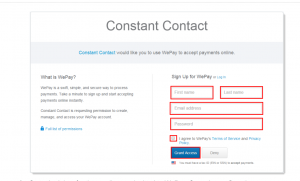 You also must have a US Social Security number or Tax ID number to raise money via WePay. 1. 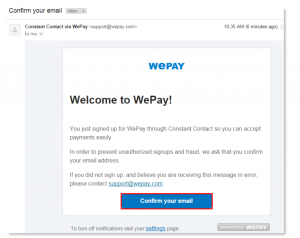 Go to the Inbox for the email you submitted to WePay. Open the confirmation email you were sent, and click the Confirm your email button. 2.You’ll now see a thank you screen. To have WePay deposit revenue directly into your bank account, go to WePay and enter your bank account information.